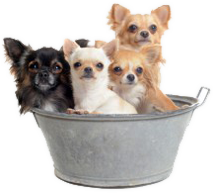 We'll Take Your Pet From Tub To Trim! "In a nutshell, this is the best groomers I've ever had to date!!!!" "Quality Great! Took my Cat in and got everything I needed for a pretty good price A+ recommended"
She is 1 of the best in our books, our toy Poodle loves his groomer n so does his parents.....thanks Lisa! We welcome feedback from our customers. Thank you for taking the time and effort to let us know how we are doing and any improvements that you would like to see. Please fill out our contact form to let us know how we are doing. If you request follow up, every effort will be made to reply to you within 24 hours, Monday - Friday. Thank you so much for choosing Lisa's Pet Grooming in Stockton, Ca. for your pet grooming needs. Copyright © 2013 Lisa's Pet Grooming. Website by: Monster Design Studios.